Last month I reviewed a few facts about the new "Evo Paralever" final drives. Here I'll go into a bit more detail, showing how I perform an on-bike inspection of a few aspects of the bike during a final drive oil change. If you're sufficiently interested and understand the concepts well enough, you can perform a similar inspection. I don't expect that to be common, so I won't concentrate on making this a detailed "how-to." If you want technical details on how to do this, get a repair manual or look online for one of the "how to change the final drive oil" tutorials. Fig. 1: Push one side and pull the other to try to discern loosness in the wheel. The three things I'm checking are the axle bearings, the pinion bearings, and the backlash. The technical details behind these three items were covered in past issues. With the exception of the axle bearings, the configuration is the same as on the older drives and I would inspect it similarly. Grab the wheel at the top and bottom and try to rock it, as shown in figure 1. Do the same at the left and right side. If you feel any movement, it will be coming from one of two places: the wheel carrier or the axle support bearings. On earlier models there was a good chance that the looseness could be in the final drive pivot bearings (where it fastens to the swingarm), but on the new models this is unlikely. If the wheel rocks, but there is no perceptible movement of the hollow axle within the final drive housing, the wheel carrier might be loose on the splined axle. If you find this, you absolutely have to visit your dealer without delay. If the wheel rocks and the black plastic ring surrounding the axle hole wiggles within the housing, there is some looseness in the bearings. BMW considers up to 1mm of looseness, measured at the wheel rim, to be normal. Starting with the 2007 model year, these bikes have a service requirement to change the oil in the final drive once (at the 600 mile service). The requirement does not officially apply to the earlier bikes but I consider changing the oil to be a good idea for all of them, as a means of seeing what's going on. If the oil is clean, you know it's behaving itself. 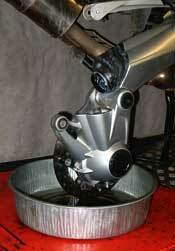 If the oil has metallic debris, you have trouble. For recently manufactured final drives, the drain plug is on the bottom. Previously it was on the back, requiring that the final drive be disconnected from the reaction link so it could hang vertically before the oil could be drained. That's not a hardship, as I want to inspect the pinion shaft on all of these units anyway. The ABS sensor gets removed because 1) it's too hard to disconnect it from the wiring harness, and 2) we need it to be removed in order to refill the final drive with oil. Remove the wheel, brake caliper (leave it hanging by a string safely out of the way), the nut on the upper link, the wheel speed sensor (pay attention to how it's clipped to the drive housing), and finally the drain plug. Oil will start to drain out. Supporting the drive with one hand, pull out the bolt on the reaction link and let the final drive dangle. You may have to push it lightly to free it from the driveshaft. At this point you have a situation like figure 2. A new K1200 will be a mirror image, as the swingarm is on the other side. If the oil is the original factory fill, it might be nearly black. That's normal. Take the opportunity to inspect any material that has accumulated on the wheel speed sensor, which is slightly magnetic. Smoosh it between your fingers. A pea-sized lump of soft debris is not unusual, but if you feel any hard particles you should make a note to check it again. Possibly you will see nothing at all, especially if the fluid was already changed. If everything is perfect, the final drive oil looks like new after 12,000 or 24,000 miles of use. 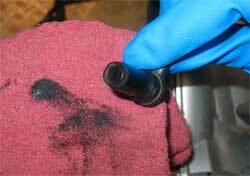 Inspect the speed sensor, the drain plug, and the oil itself. The less metallic debris you see, the better. This example in figure 3 is typical for a first oil change: about a split-pea sized lump of black sludge with no solid particles in it. Now that the final drive gears can turn free of the rest of the drivetrain, turn the brake rotor gently by hand. You should feel smooth rotation with no jerkiness. 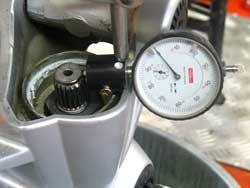 Now we'll check the condition of the pinion bearings and the backlash between the ring gear and pinion gear. The pinion bearing is simple. It's facing upright now; grab it and try to wiggle it laterally. There should be little to no perceptible side-to-side movement of the pinion shaft. 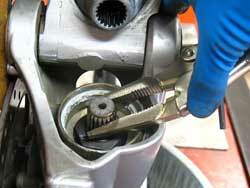 The more movement there is, the more wear has occurred at the bearings supporting the pinion. In figure 4 I'm using a dial indicator to measure the movement, but a visual/feel check alone is useful. There's no specification for this; I like to see no movement at all and would consider about 0.3mm to be a possible problem. This sort of looseness is likely to be due to wear in the pinion needle bearing. The backlash is a bit more complicated. Remember, the backlash is the rotational looseness between the ring gear and the pinion gear. Some space is required between them, and you can feel that if you immobilize one gear and try to turn the other. I'll immobilize the pinion and measure the ring gear. Lightly grab the pinion and immobilize it. In figure 5 I've used needlenosed Vice-Grips to clamp it, and I push it all against the housing to lock it in place. Once the pinion can't turn, try to turn the brake rotor. None of this requires much force at all. You should feel a tiny bit of movement; about a quarter of a millimeter at the rotor is about right. In figure 6 I've devised a Rube Goldberg contraption hopefully illustrating the movement we're looking for, but there are plenty of ways to measure this if you're good with tools. By specification, the backlash is measured a bit closer to the hub, but for an on-bike test the rotor is easy to measure. The specification of 0.10 to 0.22 millimeters works out to about 0.15 to 0.30 mm at the rotor. Obviously, if the drive needs to be reshimmed, it needs to be measured by the book. Reassembly consists of just reversing everything you've done. If the splines need a bit of grease, you can do that. Use a new nut for the upper retaining bolt; that's the spec and it costs less than a buck. Refill with 230cc of BMW 75W90. 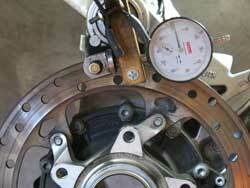 And definitely make sure the wheel speed sensor wire is routed properly so the brake rotor doesn't cut it. 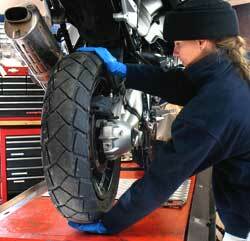 This is just a simple procedure that can be used to check out these final drives if you're doing a lube change. Now that these models have been out for over three years, an increasing number are going out of warranty and are in the "customer-pay" area of repair and owners are a lot more likely to be interested in fending off possible problems in the future. If you've done this, and you have a concern, what can you do? That depends on a number of factors. First and foremost, your assessment of these things is unlikely to be a credible basis for warranty-covered work at your dealer. If you want a shop to address something that hasn't actually been a problem, you're probably going to pay. Out of warrantly, you're also paying. At this point I can't say exactly how important any of these factors are. It's nice to have things in spec, but in reality there are plenty of out-of-spec things out there that aren't causing problems. If you decide to try any of these measurements, I'd be interested in hearing what your results are. You can send them to the RA Techline using the "Online Techline" page of the RA website.